I would like to introduce myself. My name is Kelly Provost and I own The Pro’s Real Estate Team along with my husband Joe. We have two office locations in Worcester, MA and Rutland, MA and service all of Worcester County and Central MA. We pride ourselves on working with all residential properties with no discrimination on price or condition. We work with $50,000 foreclosures and short sales and will service all the way up to multi-million dollar luxury properties. Joe and I have lived in Worcester County our entire lives. We know the city and its surrounding towns like the back of our hand. 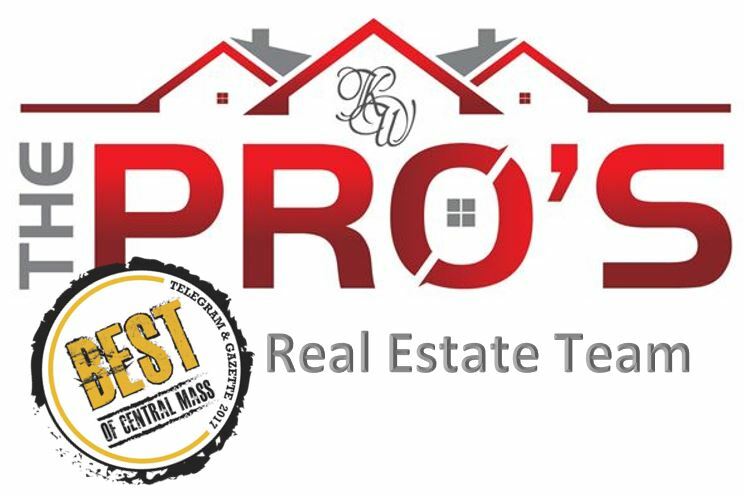 We do provide generalized real estate services to the entire 1,579 square miles of Worcester County & we are proud of it! We specialize in our area of expertise, rather than a geographic area. On our team we each have a role that consists of specific duties, rather than attempting to handle all transactions from A to Z.
I work with our clientele. I spend time to guide and educate each of our clients on the process of a home sale or purchase. I do this before we begin, and throughout the entire transaction. My role is to find home owners who have a home to sell and to find a buyer who need a home to purchase. Then, I bring the two together. I love creating lasting relationships with my clients. Joe works on the behind the scenes operations of the business. His focus is on crossing the T’s and dotting the I’s. He handles the details. Once a contract is signed he takes over in the transactions process and coordinates every detail. These details include a massive marketing plan encompassing a 151 step process, from getting a sign in the front yard and creating eye catching, engaging property websites to collecting all the necessary data needed by the attorneys, appraisers and other agents to close the deal. His ability to market our listed home is second to none! He has years of experience from his days managing multiple sales and marketing departments in one of the largest car dealerships in the state. We have some fabulous buyer specialists. Their sole job is to find our buyers the right property that fits their needs. They starts every relationship with a full and intensive buyer consultation. This will educate every buyer, from our first time home buyers to our experienced investors, about the buying process, changes in the current real estate market, and tips to be aware of as we enter the ever changing world of home buying. They are personable and friendly and take on consultative approaches so you never feel as if they are attempting to sell you something. Our buyer specialists are not sales people; they are consultants and advisors to helping you find the best house for your needs. Don’t mistake our consultative approach for a lack of negotiating power. All members of our team have a strong ability to negotiate using knowledge and confidence. All offers, counter offers or marketing/sales strategies for our listings come from experience and day to day knowledge of the current market trends. All members of The Pro’s Real Estate Team are full time Realtors®. This is all we do so you know you will always have the communication you are looking for. We understand that our clients work traditional hours. We do not limit our hours to the same work day, making it easy to reach someone when you are off work or on break or on a weekend. We respect your time and make sure we are always back with the same communication in which you reached out to us within hours, and usually much sooner! If you are looking to hire professional full time real estate consultants who will be available to you, communicate in a timely and regular manner, understand that real estate sales are as emotional as they are financial, and be by your side through the entire process; we are here to help. Just Call The Pros and you will not regret your hire. Our network of agents far exceeds the Worcester county area. If you or someone you know if moving out of the area we can also direct you to a top agent that shares the same values and work ethic as our team here. Just Ask The Pros! Some of our past SOLD homes. We would be happy to put a SOLD sign in front of your house too. We are happy to help with any and all of your real estate needs. We pride ourselves on exceeding your expectations. This is likely the reason that we can attribute over 85% or our business last year to referrals from friends and family like you.